Recirculating refrigerated fluid chillers are used in the wine and microbrew industry to control temperature in the production of fine table wines and beer. To create these high quality wines and beer the proper temperature must be maintained during the entire production process. The wine and microbrew industry has experienced phenomenal growth in recent years and Opti Temp has not missed the opportunity to grow with it. 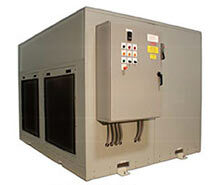 These systems have specific needs that require high harvest cooling capabilities, tight temperature control, and large capacities at low stabilization temperatures. Opti Temp offers several complete lines of high-quality recirculating refrigerated fluid chillers for the wine and beer making industry. Over the last 20 years Opti Temp has proven to be a reliable supplier of industrial chillers equipment for a number wineries and local microbrewers. 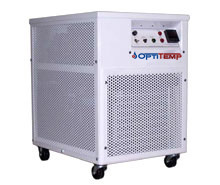 Opti Temp designs and manufactures standard cooling systems or, if needed, custom cooling systems to customer requirements for size, portability, operating conditions, thermal load, and system footprint. 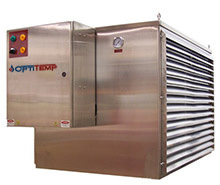 Opti Temp's recirculating refrigerated fluid chillers and non-refrigerated heat exchangers are designed for the industrial environment with a long service life in mind. These cooling systems are highly recommended for all types of wine making processes.